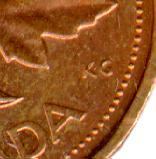 Have you ever wondered about the significance of the tiny initials found on Canadian coins? Perhaps I should first ask if you have even noticed that these initials are there in the first place. Nearly every one of the coins currently in circulation bears the initials of the person who designed the coin. Who are these unknown people whose artistic efforts indirectly affect the lives of everyone in this country. Kruger-Gray was a well-known British artist and, in 1936, he was asked by the Deputy Master of the Royal Mint in London to suggest designs for Canadian coins. Kruger-Gray produced several designs, three of which were ultimately accepted for our coinage. We have already mentioned the maple leaves on the cent. The second of his drawings is the familiar beaver which resides on the five cent coin. It is interesting to note that KrugerGray had originally suggested the beaver design for the ten cent coin, but, ultimately, it was used instead on the five cent piece. His third design to be accepted was the Canadian coat of arms and it adorned the fifty cent piece, a coin which we rarely see now in circulation. His initials flank the lower part of the crown, above the shield. When the Canadian coat of arms was modified in 1959, a new design, with initials, appeared on the fifty cent piece. 'TS' at the bottom of the shield stands for Thomas Shingles, who, for many years, was the Chief Engraver at the Royal Canadian Mint in Ottawa. Now let's look at the ten cent coin, the one with the sailboat. The initial 'H' appears just above the waterline to the left of the boat. This identifies Emanuel Hahn, a Canadian artist. Hahn used the famous fishing schooner, the 'Bluenose', out of Halifax, as his primary inspiration for the ship that has sailed on our ten-cent coins for over fifty years. Emanuel Hahn also designed the caribou which appears on our twenty-five-cent coins. There is a tiny initial 'H' which appears at the bottom centre, just in front of the caribou. Probably Hahn's best-known design on Canadian coinage is the famous canoe that first appeared on Canada's new silver dollar coin, which made its debut in 1935. On this coin we see both of Hahn's initials appearing just below the left water tines at the rear of the canoe design for the gold-coloured coins now known as 'loonies'. Unfortunately, the dies for the canoe design were lost en route to the Winnipeg mint. Apparently the RCM maintains a 'bank', or 'storehouse' of dies for new coin designs in case a new design is needed quickly, as happened in this case. So the Mint decided to go with the loon design, and the rest is history. On the loon dollar there are three initials to the right of the loon, just above the Waterline. 'RRC' identifies the Canadian artist, Robert Ralph Carmichael, from Sylvan Valley, near Sault Ste. Marie, Ontario. Until now, we have discussed initials appearing on the coins' reverse side, or 'tails'. Sharp-eyed observers will have noticed some initials also on the obverse, or the 'heads' side of some of their pocket change. It is highly unlikely that you have many coins with King George Vl. But if you do, look for the initials 'HP', below the king's bust. This stands for T.H. Paget, the British artist whose portrait of the king was used for the Canadian coinage. On our coinage dated from 1953 to 1964, we can find two tiny initials below the bust of Queen Elizabeth II. 'MG'on the truncation of the bust, stands for Mary Gillick, a British sculptress who was in her seventies when she did a portrait of Her Majesty, the Queen, for the coinage of several Commonwealth countries. This article has dealt mainly with Canada's circulating coins. Other artists have had their initials on some of the special commemorative coins that were minted primarily for collectors. But that is the subject of another article.